1. Write about something you care about. If you select a topic that is personal to you and could only be written by you, it will come through as genuine and honest to your reader. 2. In brainstorming essay topics, look back at old photo albums and journals you may have kept. Or, consider sharing a family tradition or personal anecdote that helps illustrate to your reader an honest sense who you are. 3. Show, don’t tell. Try to back up any statement you make with anecdotes. 5. Use dialogue or stream-of-consciousness writing if that helps propel your story. 6. Write in a voice and tone that reflects who you are. Your essay should sound like you. Don’t use big, fancy words unless you speak with big, fancy words. 7. Open your essay with a “hook.” Engage and immerse your reader as soon as possible. Remember, admission officers read twenty-five or more applications per sitting, so make sure yours wakes them up. 8. If you are writing about an influential person, teacher or hero, be sure to insert yourself into that essay. It can be an essay about that person but be sure to show how that person influences or teaches you in some way. Use the essay as an opportunity to see your personality reflected through that person. Show your readers who you are different or influenced by knowing that person. 9. Use active verbs, not linking verbs. 10. Avoid a five-paragraph formatted essay. Your application is not the place to write with rigid structure and formality. 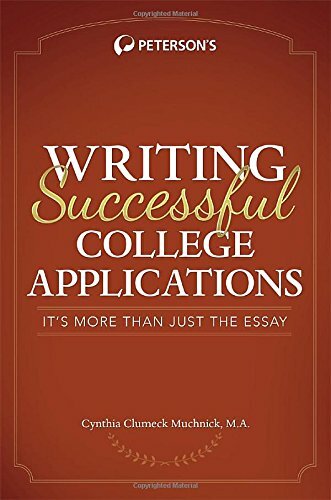 College essay writing is expository writing, so many rules of structure can be ignored. Just don’t break rules of grammar and syntax. 11. Share the essay with someone you trust and who knows you well (possibly an English teacher), to help edit (but not rewrite!) your essay. Then, proofread, proofread, proofread! – “From” and “form” are both correct on your spellcheck, so those types of errors are only caught if you catch them. 12. Do not plagiarize. Enough said. For more tips on writing successful college applications, check out Peterson’s blog.